"Is something wrong with me?" A child who is adopted asks questions, some aloud and some in secret, about why she doesn't find herself with her birth family. 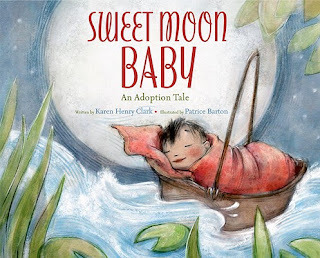 In SWEET MOON BABY (Knopf), a peaceful picture book by Karen Henry Clark, illustrated by Patrice Barton, the text starts with a clear declaration about the worth of the child: "One summer night in China, a baby girl was born. She was perfect." Next, in a tribute that's rarely found in books dealing with adoption, Clark and Barton devote two full spreads to the child's birth parents. They are both "happy and sad," acknowledging the difficult gains and losses of adoption for a family unable to keep a child. A wise reader will pause, let the child's eyes dwell on the loving hands tucking the baby into a basket, and wait for questions. With each quiet spread, the reader and hearer of the story are given space and grace to comment, notice, and question—a key part of healing in the adoption journey. Through this soft, loving story the child grasps the fact that for her, too, the adoption experience is allowed to be both "happy and sad."